KIEV, Ukraine -- The Ukrainian crisis is at a stalemate, trapped somewhere between sporadic fighting and diplomatic cheap shots, despite a reduction of the military operations along the contact line. Pro-Russian soldier in Eastern Ukraine. “The number of ceasefire violations have been clearly reduced since the middle of August […] when the peak of violations was the most kinetic activity in the summer,” Alexander Hug, Deputy Chief Monitor of the OSCE Special Monitoring Mission to Ukraine, told euronews in an exclusive interview. 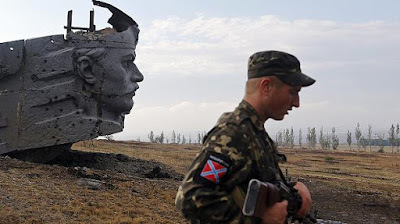 In general, observers from the OSCE (Organisation for Security and Co-operation in Europe) report that fighting is limited to certain areas that include the area around the airport of Donetsk, Pesky, Spartak, the western outskirts of the town itself and the area near Horlivka. According to February’s Minsk II protocol, Ukraine and the pro-Russia separatists should have pulled their heavy weapons (above 100 mm calibre) back 25 kilometers (16 miles) in order to create a 50-kilometre (32 miles) buffer zone. As far as the agreements are concerned, the pull-out should have been completed within 14 days of the start of the cease-fire. That never really and fully happened, since there are still some heavy weapons on both sides very close to the fire line the OSCE reports, even if these are hardly being used. The agreement also stipulated that forces should not be redeployed and this is another area where the rules are being broken. The Ukrainian army and fighters from the self-proclaimed separatist territories DPR (Donetsk People Republic) and LPR (Luhansk People Republic) tend to move into areas that have been free of military presence since the Minsk protocol entered into effect. That is not a violation of the line; they do not cross it. It is not a land grab at the detriment of the adversary. The parts extend the military presence to areas within their own territory, so the violation of Minsk’s provisions derives from the mere relocation of the units, because the document establishes that the troops should freeze. Nevertheless despite these breaches, there is hope that the agreement is providing scope for improvements because it offers a framework for the three sides to continue talking on specific issues. Vadym Chernysh, head of the Ukrainian State Agency for Donbass Recovery, represents Ukraine in three subgroups: humanitarian, socio-economic and de-mining. Both sides in the conflict are being supplied through the same grids and pipelines which do not respect the Minsk frontline. Technicians often have to cross through or work inside conflict zones to ensure vital services like electricity and water. “The cooperation seems to work in this sector, it’s a positive example for Minsk,” Mr Chernysh says. So far the Minsk process seems to be surviving thanks to dozens of such small and medium achievements, whereas bigger issues are still far from being resolved. “Illegal armed groups and military equipment, fighters and mercenaries,” as the protocol determines, have not been fully withdrawn from Ukraine, while “the permanent monitoring of the Ukrainian-Russian border and verification by the OSCE with the creation of security zones in the border regions of Ukraine and the Russian Federation” have not been set up yet. That is to say that the Ukrainians should, for instance, organise free elections in those territories without controlling the border with Russia in the areas of Donetsk and Luhansk. Holding local elections in accordance with Ukrainian law in the rebel territories of the DPR and LNR seems an impossible task, since it mainly depends on the core of the Minsk agreement, article number three, which is about the decentralisation of power. That constitutional modification went through a particularly devious political trial since most of the Ukrainian political forces consider the “special status” as a kind of Trojan horse for Russia to hold Ukraine in permanent check. Special Status or Special State? “It is clear to us that the policy of our aggressors is to split the country in two parts by forcing us to implement the special status. We think that Ukraine is a unitary state. Since we want to reintegrate those territories into Ukraine, we are contemplating a peculiar type of self-governance in view of their reintegration. That’s what we call peculiarity of local self-governance,” the speaker of the Ukrainian parliament, Volodymyr Groysman, told euronews in an exclusive interview. Controversy still reigns over President Poroshenko’s decision to agree to the “special status” part of the deal. Some argue that he was coerced by the threat of a full-scale military offensive and pressure from the Minsk deal brokers France and Germany. Others claim that Poroshenko overreached his powers by failing to secure parliamentary approval. Hence, when it comes to the bigger principle the Minsk agreements are far from being implemented. The current stalemate could turn into a long term situation, leaving a de facto but unrecognised split in Ukraine. Only a comprehensive agreement in Eastern Europe between Ukraine, Russia, the USA and the EU could solve this geopolitical jigsaw. Western diplomatic sources in Kiev say they want Moscow to drop its opposition of the association agreement between Ukraine and the EU due to be implemented on January 1, 2016 as a first step towards progress. But current circumstances do not seem to suggest any Russian willingness to absorb the political impact of the formalisation of a closer relationship between Kiev and Brussels. And the EU Council on December 17 adopted the rollover of sanctions against Russia. One of the causes of the Ukrainian conflict was the question of the Association Agreement that is currently the object of Moscow’s dislike. Very few observers, diplomats and policy makers in and outside Ukraine seem to believe that the current status quo in the Ukraine and Eastern Europe was (and still is) the goal of the Kremlin when it annexed Crimea and backed up armed insurgency in Donbass. We may be complicating things too much. Bear in mind that Russia truly expected to enjoy far greater success in southern and southeastern Ukraine than it did. Remember "Novorossiya"? Had this project succeeded as planned, "free" Ukraine would now be a rump state. So when Putin was unable to follow-up because of far greater resistance than he anticipated, he could not (and would not even if he could) throw in the towel. To do so meant "defeat". So, instead, he decided to hold on to the area he controlled and hope that by dragging things out, events would favor him and he could leverage his control into serious concessions from Ukraine or, in the alternative, make it difficult for Ukraine to resume a normal life and quietly integrate into Europe. The "stalemate" exists because all sides want a stalemate in preference to the alternative. The EU has no long-term interest in either the return of Crimea or reintegration of the Donbass but must wait a reasonable time before conceding Russian "ownership". Sanctions cost Europe little and is a useful show of EU solidarity with Ukraine against a rogue state. Another 6 months ...perhaps a year....and the EU will get tired of it. Putin realizes that any further push into Ukraine will be more costly than he had anticipated and may invoke additional economic and military pressures that he is not prepared to risk. The status quo is well within Russia's ability to maintain because it cares little about the plight of the residents. And Ukraine dare not push militarily to recover the east because it doesn't want to provoke a military showdown with Russia which may prove to be exceptionally damaging to Ukraine. Although all three sides know that the Minsk agreement is now simply a diplomatic charade, all three can use it as the excuse for the stalemate. The solution will come when a new, liberal regime comes to power in Russia; or when Russia succeeds in putting more of its friends into power in Ukraine; or when Ukraine develops a sufficiently powerful "Special Operations" force capable of active and continuing disruptions, assassination, sabotage in the Russian controlled sectors and on interdicting supplies entering the region. Until then all sides are hoping that the "law of unintended consequences" will help resolve the stalemate.